We’re riding on a Beauty and the Beast high right now. 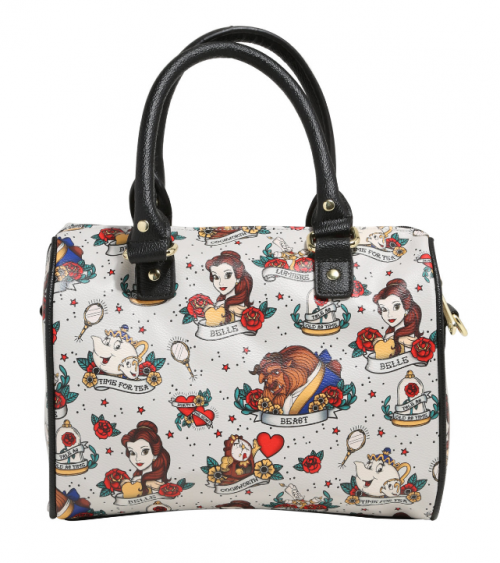 And we’re liking the look of this Beauty and the Beast Tattoo Tote by Loungefly. It’s hip, it’s modern, and it can hold all of your stuff without whining and complaining about it. We’re quite enamored with Disney Bags in general. You should check out some of our faves over in our Disney Handbag Gift Guide and on our Disney Accessories page. Is it bad that I kind of want that Mrs. Potts and Chip Tattoo? Biker babe does Disney! My daughter would love it.